Innovative digital payments company Square has been used for political campaign fundraising for quite a while now, but this morning the startup announced that individual staff members can now accept credit and debit card contributions on their mobile device on behalf of their political organization of choice. It’s worth noting that Square rolled out this enhanced functionality a few weeks ago, first focusing squarely on merchants, but it’s interesting to see the company now double down on political fundraising campaigns in the US. Campaign staff members can sign up for Square, download the free Square Card Reader iOS or Android app and receive an actual card reader (which is also free of charge). When they collect payments from contributors, funds are deposited in the campaign’s bank account the next business day, Square notes. Importantly, during the contribution process, all required FEC information can be collected to ensure the campaign’s compliance even before the payments are made, and political organizations can set their own terms and conditions. According to the press release, they can also add and manage staff and create detailed reports on fundraising progress and contributor information from their Square account. Back in January 2012, the election campaigns of U.S. President Barack Obama and U.S. Governor Mitt Romney both announced that their staff and volunteers would be able to accept campaign contributions using Square. 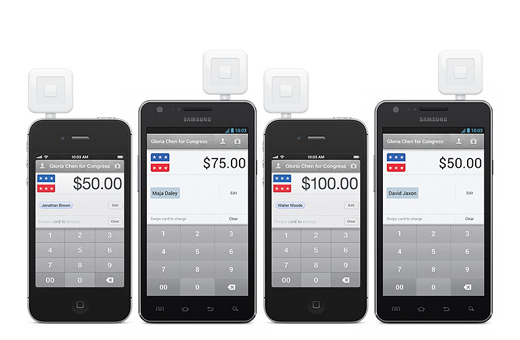 Clearly, this is a stellar way for Square to increase awareness and the amount of card readers out there.